"...with a touch of Maple Bourbon flavor." SCREEEEEEEEEECHHHHH. Back up the truck! What's that again? 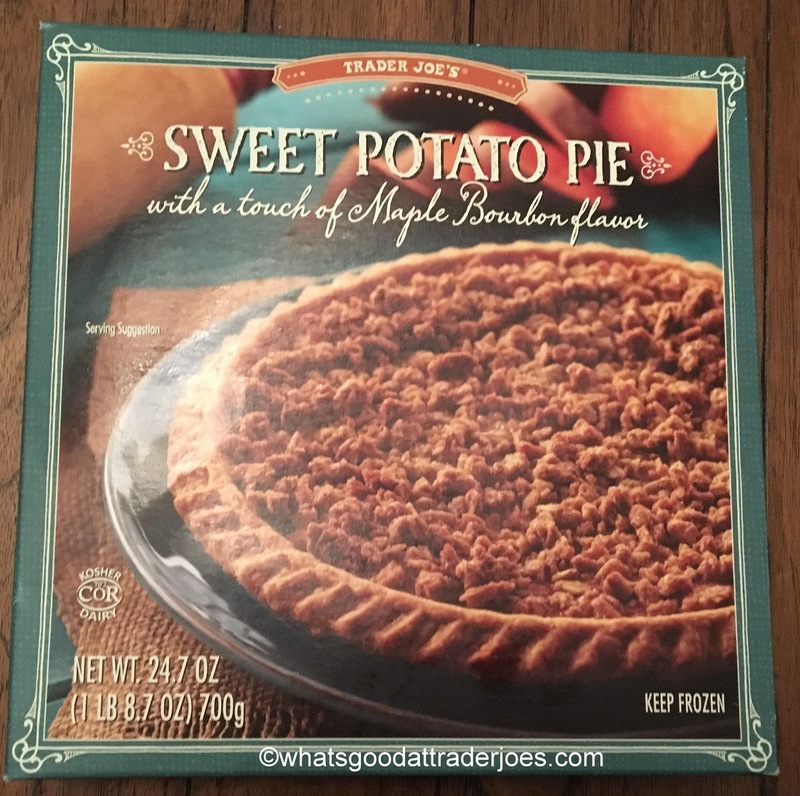 Trader Joe's Sweet Potato Pie....with a touch of Maple Bourbon flavor. Inconsistent capitalization aside, just how awesome does that look? If the words "sweet potato pie" didn't do it for you, I really hope that "maple bourbon" would. Wednesday night was a perfect night for our family to gather 'round for a little warm comfort food dinner. Aside from a long day after a very short night's sleep, the cool, damp, chilly November air finally began sinking in around the 'burgh area. Sandy whipped up a fantastic homemade lasagna, which I probably (and unashamedly) ate four too many servings of, and would have had more if she didn't have this pie warming up in the oven in the meantime. I wouldn't say that I love this the TJ sweet potato pie - I'm too spoiled by generations of excellent bakers in my family, Sandy one of them - but for a simple, store bought pie with an autumnal slant, it's up there. Big time. You can keep your pumpkin pies to yourself. 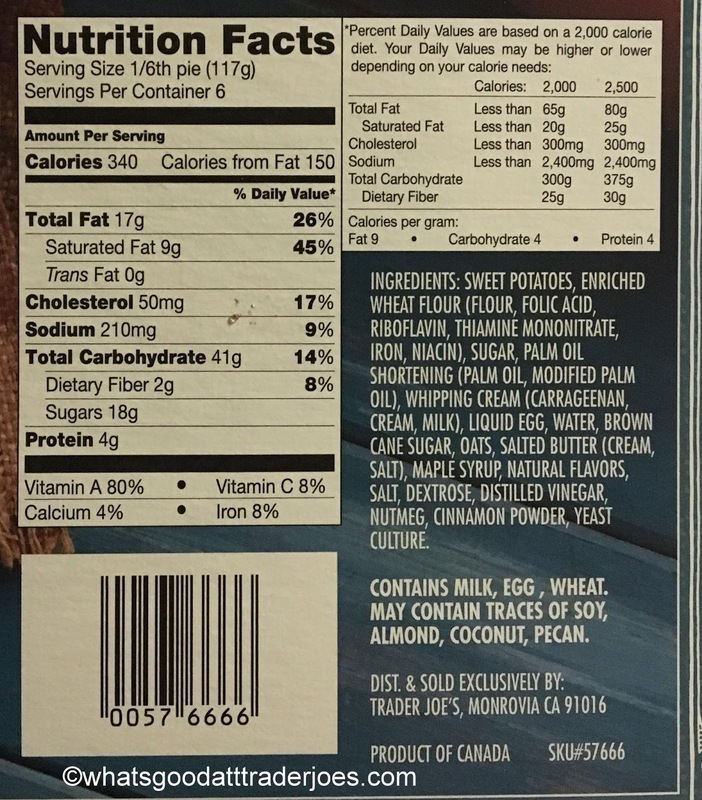 Although fairly similar, sweet potato pie is a tad different - more natural sugars, of course, but also a lighter, fluffier texture itself. The write up of this pie in the Fearless Flyer mentioned something or other about the taters being kettle cooked so as to more closely resemble whipped potatoes - presuming that's true, then it was very well done. But of course the real star has to be that "Maple Bourbon" flavor, right? 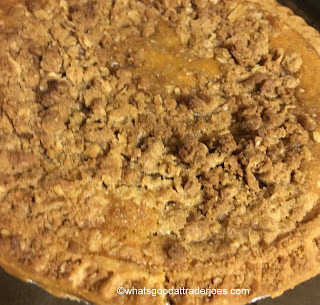 That comes in the form of an oatmeal-based crumble that was somewhat unevenly disbursed on top of the pie. The crumble did add a grainy feel, but with so much flavor - cinnamon, nutmeg, a lot of maple, and yes, even a little bourbon. I'm not sure if either of my grandmas ever made sweet potato pie for a holiday dinner, but if they did, this wouldn't be at the kid's table. As for the crust, it fulfilled its duties admirably enough. It wasn't fancy, but not exactly nondescript - slightly buttery, a little flaky, definitely crispy, and held together. Made for a good bake. It's $6.99 for the pie, and does require 25-30 minutes of oven baking as it's from the frozen section, so plan a pick up of the pie accordingly. For us, on a night a good family dinner without much fuss was needed, it worked great. 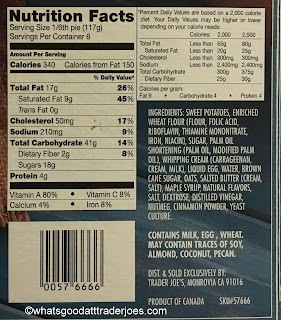 Although I will say that our two kiddos opted for a popsicle after taking only a small bite - oh well - more for us then! Can't complain too much, although I would have preferred a little stronger bourbon presence. Then again, things are rarely perfect.